In 2007, Jeff Gerstmann was fired from his editorial director role at Gamespot. This afternoon, he finally got a chance to clear the air on exactly what happened. Backstory: Following a less-than-glowing review of Kane & Lynch: Dead Men, Jeff Gerstmann was shown the door by the management at Gamespot. Immediately, the internet burst into a frenzy, claiming that the gaming site was motivated purely by greed, and that Gerstmann's review had marred the group's friendly relationship with publisher Eidos (a company, it should be noted, that was heavily advertising Kane & Lynch on the site at the time). 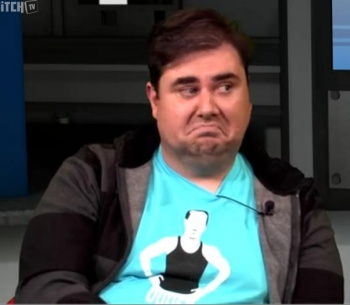 In turn, Gerstmann went on to form Giant Bomb, a gaming site that has become a success in its own right, both due to its editorial quality, and undoubtedly as a benefit of the furor surrounding Gerstmann's scandalous employment shift. This morning it was announced that Gamespot parent company CBS had acquired Giant Bomb, and was moving the site's HQ into the same building currently occupied by Gamespot. Realizing the confusion this might caused, both Gerstmann and the Gamespot team decided that it was time to explain exactly what happened all those years ago. The issue, Gerstmann claimed in a streaming interview, was that a new management team inexperienced in dealing with editorial groups, had come to power at Gamespot and overreacted to what Gerstmann describes as "publisher push-back." According to his recollection, Eidos threatened to pull ad revenue from Gamespot as a result of his review, and though this kind of thing is relatively common in games journalism, the nascent management team panicked and decided that Gerstmann was unreliable. "They felt they couldn't trust me in the role," Gerstmann said. "We did what an editorial team does. We did what we were supposed to be doing. We reviewed games, we instructed people about the quality of games, and we were completely honest," he added. "This management team buckled when faced with having a lot of ad dollars walk out the door." Following the incident -- which Gerstmann calls "the craziest thing that's ever happened to me" -- he was deluged with attention. To the point that his parents were getting phone calls from Norwegian newspapers at four in the morning. Eventually things blew over, but you'd be hard-pressed to find anyone who was present in the gaming world back then who doesn't immediately associate Gerstmann with the incident. Thus, today's live interview, which Gerstmann and the Gamespot team hope will set the stage for their continued success. The management team who originally canned Gerstmann are no longer with the company, and according to the man himself the content of Giant Bomb will be in no way censored or lessened by this new business agreement. And with that, a dark chapter in the history of games journalism draws to a close. A setting sun gives way to an even brighter tomorrow, or something. Now who's up for tacos?